On a recent trip to St Austell, I was quite excited to discover Nature Kitchen, a shop dedicated to spices and herbs. One of the purchases I made that day was a pot of bilberry powder (ground dried bilberries). Bilberries are the UKs native blueberry and grow wild around these parts. They are incredibly good for you, but the season is short and they are often difficult to find. They are also much smaller than the commercial blueberry that most people are familiar with. Buying the powder, I reasoned, would not only enable me to give a blueish colour to cake icings, but would imbue me with super powers too!!! Eager to try this out as a flavouring and colouring, I decided to make some wild blueberry cupcakes at the first opportunity. I had a pot of wild blueberry spread I could also use (jam really, but because it’s made with apple juice rather than sugar, EU regulations prevent it being called jam). I based the cake part of the recipe on the one given for raspberry cupcakes in Cupcakes from the Primrose Bakery, substituting the blueberry spread for the stated raspberry jam. I also used half wholemeal flour as I usually do and made a couple of other tweaks. The icing I made up. Creamed 110g unsalted butter with 180g cardamom (caster) sugar until well beaten and fluffy. Sifted 125g self-raising wholemeal flour, 120g plain white flour and 1/4 tsp bicarb of soda. Measured out 125ml milk and added 1 tsp vanilla extract. Stirred in 1/3 of the flour, followed by 1/3 of the milk. Repeated this process twice more until all flour and milk incorporated. Roughly stirred in 3 tbsp blueberry spread, so that the mixture was streaky rather than all one colour. Spooned into 12 of my favourite blue cupcake cases and baked at 180C for 20 minutes. Left to cool a little then turned out onto a wire rack to cool completely. Melted 50g white chocolate (Green&Black’s) in a bowl over hot water, then left to cool a little. Beat 125g mascarpone cheese in a bowl with a wooden spoon until smooth. Added, rather cautiously at first, a bit of the bilberry powder and stirred it in. Then proceeded to add larger and larger quantities as the colour was not as powerful as I thought it might be. I probably used a rounded teaspoonful in the end. Spread over the top of the cakes with a palate knife. 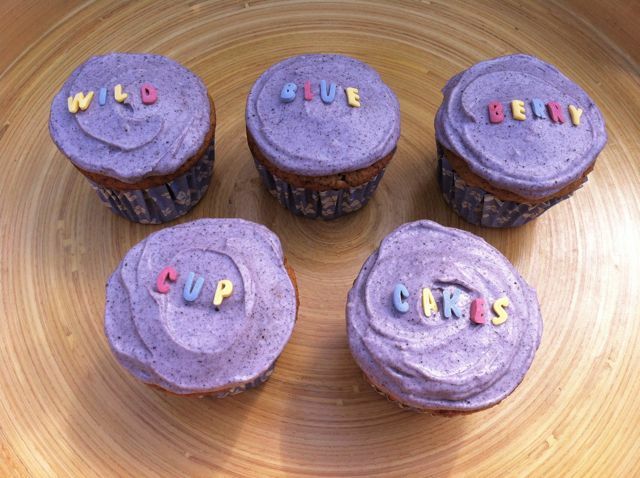 Used some of the sugar alphabet letters from my recent cake decorating wins to write Wild, Blue, Berry, Cup, & Cakes on the top (this was rather time consuming and I’m not sure I’d be so exacting again). The cakes were delicious, well risen, moist and surprisingly light. The icing was also good and set the cakes off nicely, I thought. I loved the colour, but was a little disappointed that I couldn’t taste anything in the least bit fruity. CT, however, as a seasoned bilberry forager was adamant he could taste the bilberries. My palate obviously requires radical cleansing. As B is the letter chosen by Ros in this month’s AlphaBakes, I’m submitting my Blueberry cupcakes to this monthly challenge hosted alternately by The more than occasional baker and Caroline Bakes. I’m also adding this to Made With Love Mondays, a blogging event created by Javelin Warrior which I keep meaning to enter but never seem to manage. The aim is to encourage people to make everything from scratch rather than using ready made items. Yes indeed Susie, that’s what I was so excited about. I love these – such a beautiful colour and the bonus being all natural. I have to get myself some of this bilberry powder. Thanks Jennifer, the bilberry powder was a great find. What a gorgeous colour – it would make pretty macarons! I love how cute these look, such a lovely colour and good for you too? Major bonus! What a brilliant colour! I love that it’s achieved naturally from fruit. The cupcakes look lovely un-iced too, although it’s a shame the flavour didn’t come through as strong as you had hoped. Choclette – these are awesome! I love the color of the frosting and I can’t believe I’ve never heard of bilberries before. And I must find me some of that powder because it does such a beautiful job at adding eye appeal (and perhaps flavor?). Thanks so much for sharing with Made with Love Mondays – what a treat! the stuff in the bowl… not the bowl itself you understand! They look beautiful! Fabulous colour! Great colour from the wild bilberries. Pity the flavour wasn’t more pronounced, maybe including some blueberry jam would bring it out? I love the colour! How strange that the taste wasn’t strong. These really caught my eye-you are clever coming up with such an idea! Gorgeous, gorgeous colour! And so much nicer to know it came from a natural product than a food colouring bottle. Pity the taste wasn’t stronger, but I suppose it means you’ll be able to marry it with other baking flavours more easily. Thanks, yes from now on it’ll be milk chocolate chunks in the banana bread all the way! these cupcakes are so beautiful! I love the vivid purple tones. Bilberry powder – how unusual! what a shame the taste didn’t come through stronger but I love the idea of them. It’s certainly a great ‘B’ bake! Wow! Love the color of these gorgeous cupcakes! Never tried Bilberry powder so not sure how it taste like. Maybe by using some fresh blueberries like I did for my Blueberry tart will make it more tastier or even blueberry jam will help. I didn’t know you could get bilberry powder. The colour is fantastic.